The Bulgarian words for vampire derive from the original Slavic opyri/opir i, and appear in modern forms as vipir, vepir, vapir, or vampir. Bulgarians believed that spirits of the dead embarked on a journey immediately after death that visited every place they had visited during their life on earth. Their journey lasted for 40 days and then the spirit went on to its next life. However, if the dead were not properly buried, they may find that their passage to the next world was blocked, and might return to this world as a vampire. Certain people were predisposed to becoming vampires. These included people who died a violent death, those excommunicated from the church, and drunkards, thieves, murderers, and witches. Tales circulated about vampires who returned to life and started their lives over again in foreign towns, even to the extent that they would marry and father children. Their only perceived abnormality was their nightly journey in search for blood. To Gagauz people, vampires were obur, renown for their gluttonous blood drinking, ability to move objects like a poltergeist, and their capacity to produce noises like firecrackers. People would try to rid their town of obur by offering it rich food or excrement. The ustrel was another type of Bulgarian vampire – the spirit of a child born on a Saturday but who died before being baptized. 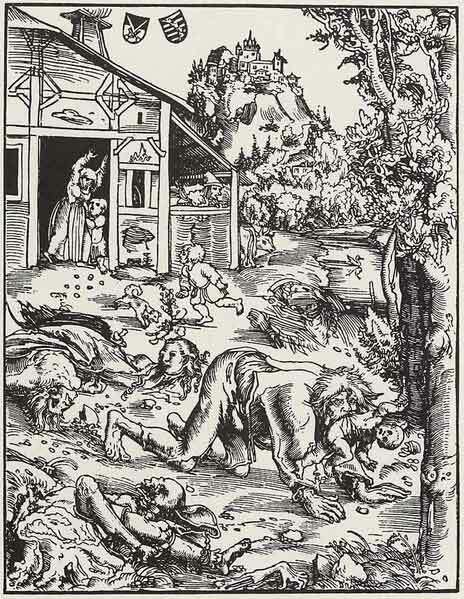 The ustrel would come to life on the ninth day after burial and seek the blood of cattle or sheep. It would feast all night and return to its grave before dawn. After 10 days of feeding, the ustrel would become strong enough that it no longer needed to return to its grave. It would rest during the day either between the horns of a calf or ram or between the hind legs of a milch-cow and would attack the fattest animals at night. To rid oneself of a ustrel, a vampire hunter (vampirdzhija) could be hired to find the vampire. After a vampire was identified, the community could perform a ritual known as the lighting of a needfire. This ritual began on a Saturday morning. All the fires in the village were put out and the cattle and sheep were gathered in an open space. The villagers then guided the animals to a crossroads where two bonfires stood on either side. This ritual was thought to rid the animal the vampire had taken up residence in of the vampire and trap him at the crossroads, where wolves would devour it. Other methods of killing vampires include the traditional stake and a method called bottling, where a specialist called a djadadjii would chase after the vampire with a holy icon such as a picture of Jesus, Mary, or one of the Christian saints. The djadadjii would drive the vampire towards a bottle that contained its favorite food. Once the vampire was lured into the bottle, it was corked and thrown into a fire.